Subtitled ‘Dynamic Quilts Made With Line & Shape’ this book promises much. Every quilter wants to make dynamic quilts. It begins with ‘Where You Are’ and goes on to the usual tools and materials section but with some very good tips, then ‘Color, Pattern and Repetition’ sadly basically colour wheel stuff, ‘Ruler Made Stripes’, ‘Mat Made Stripes’, ‘Polka Dots’, ‘Triangles’, ‘Chevrons’, ‘Checks’ and finishes with ‘Putting It All Together’ plus resources. An outstanding line in the introductory chapter for me is ‘I hope you can begin this quiltmaking journey with a willingness to fail’. As a teacher I encounter so many students who expect to succeed from day one, who become despairing at their failures. Maria Shell understands my philosophy that all making is good on one level or another. The sections are basic geometry work with good ideas for quilts and techniques. Even the ‘polka dots’ are not circles but squares and strips. Some design ideas and how to work out your design as well as construction. Brief but interesting. 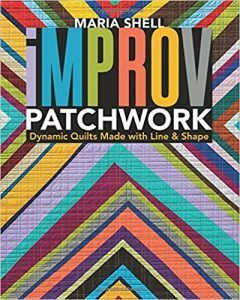 I have come to know the term ‘improv’ as working ad hoc, but this book does work more to grids, so I am not sure it was wise use of the word ‘improv’ in the title. I think Experimental Patchwork would have been a better title. 31 embroidery and stitch projects that will have you drooling. Sew and embroider all manner of bags, clutches, notebooks with contemporary stitch designs. Aimed at the younger under 40 end of the market, this book is perfect for those who need to know all the sewing basics. You’ll find simple projects to hone your newfound skills. The basics and techniques section is comprehensive, making this a great book for the beginner. This section also includes all the embroidery stitches with diagrams and photos. It takes you through the notebook sampler page by page. The rest of the book is largely taken up by the projects. These have wide appeal, with easy to follow instructions and clear photography. You can download and print the patterns. It’s all about simple practical sewing and learning embroidery in a way you will love. It’s always nice to see a new quilt book that presents something really different. This book is dedicated to wedges and ways in which to use them. The book is divided into Basic Round Construction, Round Variations and Beyond Rounds. In the introduction, you’ll see photos from the Volckening collection of quilts. You’ll discover wedge basics, rulers, shapes, possibilities and formulas. In the first chapter, you’ll see all the essentials, information and avoiding the pitfalls of construction. The projects hone your new found skills. Instructions are clear and easy to follow with great photos and line drawings. In chapter two, you’ll learn some variations on the theme. These tend to be fabric oriented i.e. scrappy, two colour wedges and not variations on using wedges in innovative design ways. Another three projects follow. Chapter three is about designing wedges that are not in the round. There is no design instruction as such, this section goes straight into five more fantastic projects. That’s ten projects in all of varying sizes. The book finishes with some basic quilting techniques such as machine applique and setting in a circle. There are some ideas for quilting. The afterword explains the creative making of the Sacred Heart quilt. 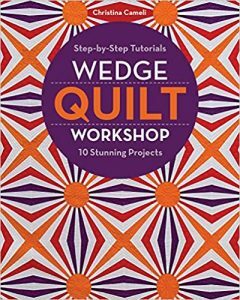 A very enjoyable and informative book on quilting wedges. I must say first of all, that I am not a fussy cutter, yet I do admire those perfect cuts, arranged to feature the fabric. It is extreme fabric play. 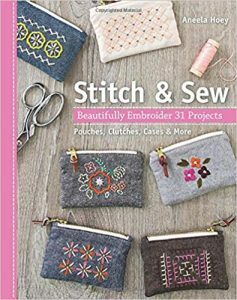 The book includes the basics, tools, suitable fabric guide, tutorials, colour, cutting, piecing and finishing. Tutorials include EPP, cutting to make a new repeat and other how-to’s. There are 14 projects to ensure you get to grips with fussy cutting. It’s all about the placement of the print within the design of the quilt. So you would cut out the motifs from the background print. Great projects include a nine-patch pot holder, coasters, pincushion, pouch, cushion (pillow), mini quilts and other quilts, table runner, place mats and totes using different techniques. The clear instructions are accompanied by excellent photos and line drawings. It did not set my world on fire, some of the colours and fabrics were off-putting but it is a good introduction to the techniques of fussy cutting and that’s what matters. When Angela’s name is on the cover, you know you are in for some quilting magic. I, like many quilters, am a sucker for nine-patch and I love it best when traditional meets modern. So I opened my copy of this book with great expectations. The front cover is busy, bold and intriguing. You can easily see all the quilting projects inside the front cover and they are wide and varied – an excellent mix. 21 projects in all so one or three for everyone there with Jennifer’s fresh, contemporary approach. You’ll find everything here from basic construction to variation with imagination. Very clear instructions with illustrations make this book easy to use. I like it a lot. Will also spark other ideas and you can easily interpret and adapt these wonderful quilts. 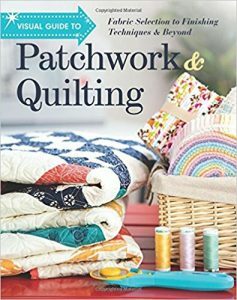 Everything you need to know about patchwork and quilting in one handy volume. If you need visual guidance to quilt – here it is. The book has a nice feel to the cover and is visually appealing with all the bright, detailed photos. Everything is laid out in 8 comprehensive chapters. Tools & Supplies, Fabrics, Piecing, Applique, Quilting by Hand or Machine, Finishing, Beyond the Basics and Reference. Jam-packed full of useful tips and information. 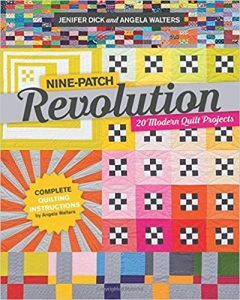 A complete handbook to know how to quilt plus projects and 25 block patterns. The blocks get you going with thinking about design and the projects hone your skills. 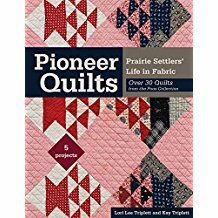 This book will make you a better quilter. Slight niggles are some of the pics are too small. Overall I believe this is a book every quilter should have. Subtitled ‘Draw, Collage, Stitch & Show’ this book is just that and you need to bear that in mind. 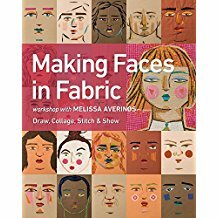 It gives you the techniques and know-how to make faces on fabrics, so it does not matter if you like the style or the drawings, you will be using the techniques to develop your own creativity. The book is divided into four parts named in the subtitle. Chapter One is about drawing and proportion – where does your nose fit into that face? Tips for drawing and positioning features. It is on a very basic level that is excellent for beginners. Chapter Two – selecting, cutting and positioning fabrics for a collage face. Chapter three is about stitching the collage in place.Chapter Four contains projects to try out your skills. A cushion, tote, wall art, embellishing a shirt. The book finished with a Gallery of work, both by the author and by students. It skims the surface using basic techniques that are detailed enough for anyone to have a go and produce reasonable results. 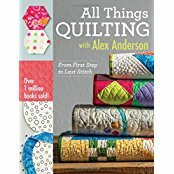 Here is a list of quilting books I have found to be really useful, with the reviews I wrote about them if applicable. It is a work in progress, starting with the most recently released books. I will add to the list as new books come out, so keep checking back please. Quilt Traditions by Devon LaVigne. ISBN 9781617455223. What a wonderful way to learn traditional quilting. 12 great projects and 9 skill-building techniques. Each quilt has a story to tell. Good design is the basis of this interesting book. Perfect your quilting skills with strip piecing, half-square triangles, templates, paper piecing, machine appliqué and sewing set-in seams and curves. You can see how the harmonious colour selections enhance these wonderful quilts. Easy to follow instructions and clear photos and diagrams seem to make the process easier. I really enjoyed this book. Pioneer Quilts by LL and K Triplett. ISBN 9781617454653. The authors are the proud owners of a large quilt collection from their pioneer grandmother. They are documenting their historic collection for all to see and enjoy. In this book, you will find 30 quilts from the famous Poos collection. These are photographed in detail. 5 projects give instruction for you to make a quilt from an antique design. The book begins with an introduction based on historical research and diaries from the 1800s about life on the Plains and migration west. There are superb reproductions of the quilts, each with a description. The 5 patterns have been re-created for the modern quilter and are suitable for the intermediate skill level. The large Delectable Mountains quilt is c. 1850, Wild Goose Chase from c. 1875, Cake Stand from c.1890, Red and white Nine Patch from c. 1870 and Double Four-Patch Crib Quilt from c. 1880. You’ll find everything you need to know to make these 5 wonderful quilts. They are not my favourites from the book however, but each of these quilts is a piece of history. 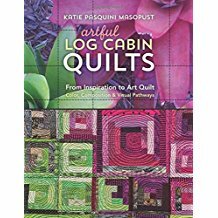 Artful Log Cabin Quilts by Katie Pasquini Masopust. ISBN 9781617454509. Katie is one of my favourite quilt authors. She has the most wonderful ideas. If you are thinking traditional log cabin quilts, think again. 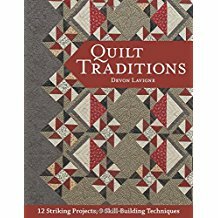 This book takes you from inspiration to a modern interpretation of log cabin quilts. Make free-form blocks from any image. Contents include history, inspiration, grids, fabrics, cutting, construction, quilting and finishing plus a gallery. There are lots of ideas for composition. The book has easy to follow instructions and is illustrated throughout with fabulous images of work. A simple design idea that works and will transform your quilting. It doesn’t, however make me think of log cabin quilts, but very very artful, yes. Great designs, great use of colour, fabric and stitch. 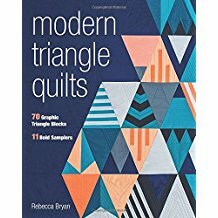 Modern Triangle Quilts by Rebbecca Bryan. ISBN 9781617453137. 70 pieced triangle blocks make bold, geometric designs to play with in your quilt-making. There are 3 basic triangular shapes used to make blocks. These are used singly or joined to make diamonds or larger triangles. You’ll also find 11 sampler quilts that are simple to piece with no set-in seams. Explore bold, dynamic design, colour, visual texture and balance. Enhance with stitch. I love the Upstart quilt (I would have put this one on the front cover). It is dynamic and a very adaptable design, as shown in Skylines and Facets. At the back of the book are fold-out template patterns. The instructions are clear and I would expect this to be one to be a bestseller. All Things Quilting with Alex Anderson. ISBN 9781607058564. Don’t know how to quilt? Want to learn but can’t get to classes? Here is a superb book to help you along the journey. Few sit down and create a masterpiece straight away, but this book will certainly iron out a few wrinkles. Learn all about materials, tools and techniques. Found out how to design, draft, cut, piece, applique, construct, quilt and finish. Expand your quilting horizons no matter what your skill level. This is not just about tips and measurements, this book encourages you to play and think before committing. Includes great photography and easy to follow instructions throughout. An absolute classic. 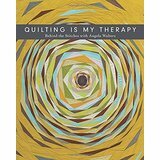 Quilting Is My Therapy by Angela Walters. ISBN 9781217455162. I have admired all Angela Walters’ books but this one has me mesmerized. That gorgeous cover is soft to the touch and I keep stroking it – it is almost like a piece of fabric. This is a collectible book of the stitches and quilts created by this amazing machine quilt artist. See how she chooses free-motion stitches to adorn her quilts. Such a magnificent book with incredible knock-out photography. Includes beginnings, hand to machine quilter, going pro, go big, back to the future, about the author, Special detail has been paid to extra thick paper and a cover with flap and it is simply superb in a word. It’s like stitch combining to accommodate the quilt design and enhance perfectly with stitch. Sharing her fabulous skills for all to see what they too can achieve. This is all about the beauty of quilting, highlighting the stitch. It’s not what you do, it’s the way that you do it. Angela does it so fine. 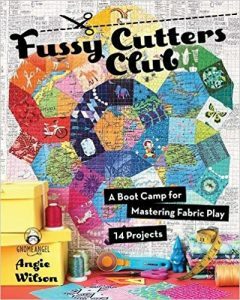 It is not a step-to-step free-motion instruction manual, but Angela talking about her incredible journey to be one of the best quilters. Highly recommended.